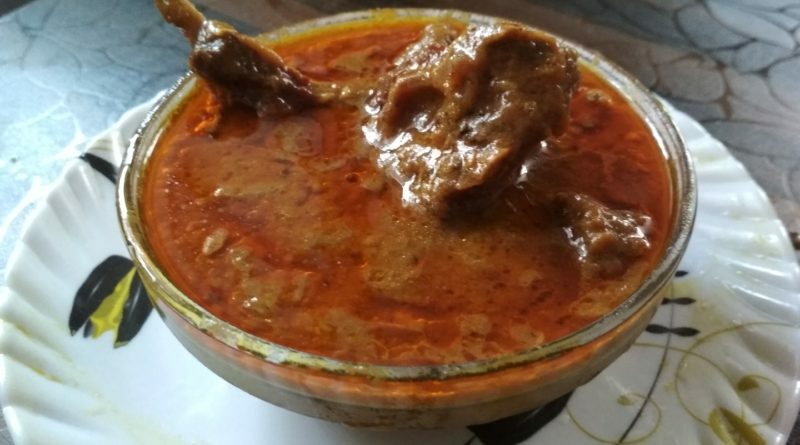 Rogan josh is the signature Kashmiri nonveg dish its one of the most famous nonveg dishes among non-veg food lover . all the exotic spices like Kashmiri red chili powder, cardamom, and cinnamon make the dish tasty.dish go very well with rice or paratha. 3 table spoon lemon juice. 250 gms sour curd (dahi) beaten well. 4 tbsp Kashmiri chili powder(lal mirch). 1 tbsp fennel seed powder. 6 pcs green cardamom(Chooti Elaichi). 3 pcs black cardamom(Badi Elaichi). 1 tsp dry spices powder (garam masala). In a mixing bowl take mutton and add lemon juice and keep it aside. marinated it for at least 2 hours. In a grinder add 6 cardamoms, 3 black cardamoms,20 pcs black pepper. also add 4 Kashmiri chili powder,1 tbsp dry ginger powder, 1 tsp of garam masala powder, 1 tbsp fennel seed powder.and prepare the mixture. In a bowl take the curd and add the powder mixture.and prepare the paste. And mix it smoothly and prepare the smooth paste. Heat the oil in a frying pan and one by one add all ingredients like bay leaf, cinnamon stick, black and green cardamom and 1 pinch of hing.keeep the flame low. Next, add the marinated mutton and saute it till each side get little brown keep the flame medium. Add desi ghee and spice paste in the pan. and mix it properly.and cover the pan let it cook keep the flame medium.for 15-20 minutes. next, add salt according to taste.and stir it. add water and cook it for 50 minutes in very low flame.or till mutton gets cooked. your dish is ready to serve take the dish in serving pan.